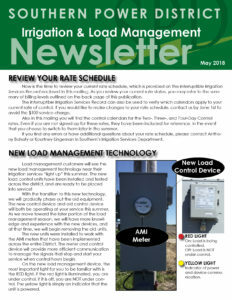 Each year, Southern publishes an annual edition of the Irrigation & Load Control Newsletter. This publication is distributed to irrigation customers in early June, just prior to the beginning of the typical load control season. Check out our most recent newsletter. Be watching for the 2019 edition to hit your mailbox in late Spring!